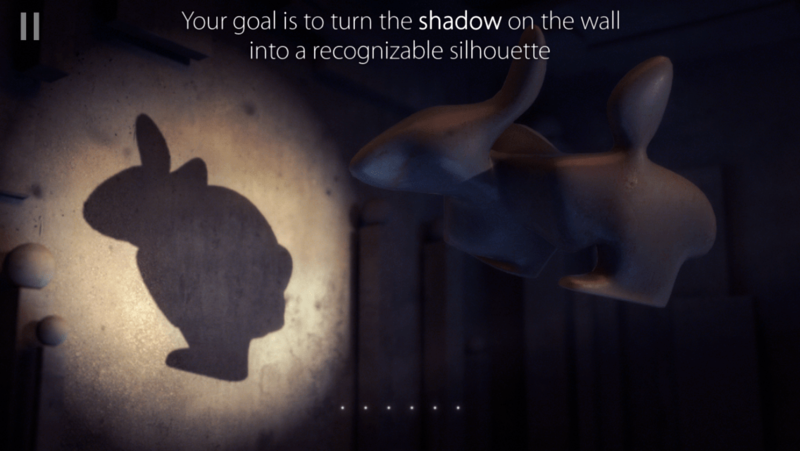 I only knew about Shadowmatic a few weeks before its release, but the second I saw video of it, I couldn’t wait to get my hands on the game. It looked like something that had the potential to be a real classic and, if done right, the perfect touchscreen game. 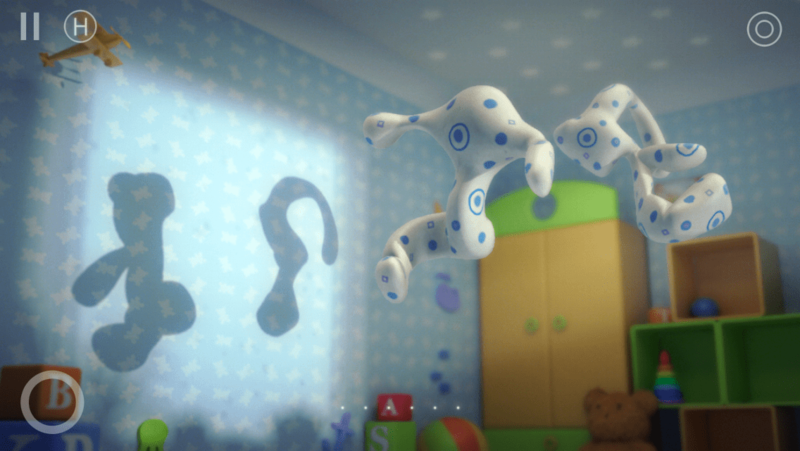 It has a simple idea paired with photorealistic graphics and what could be both relaxing and challenging at the same time. 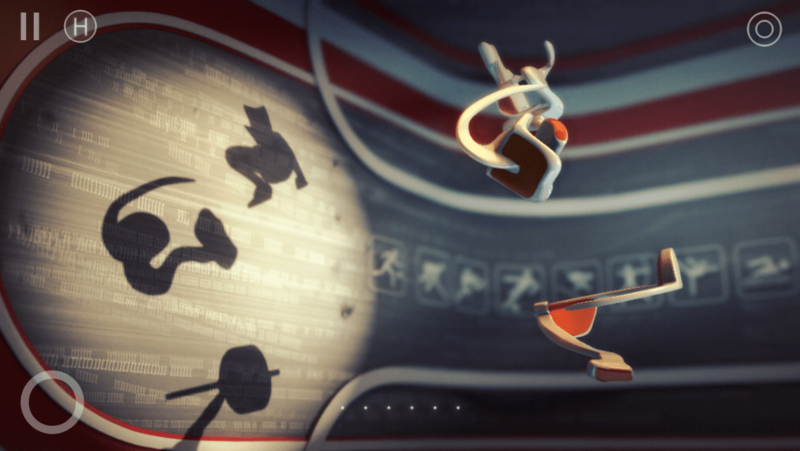 The way the game works is you’re first given an abstract object in a spotlight. 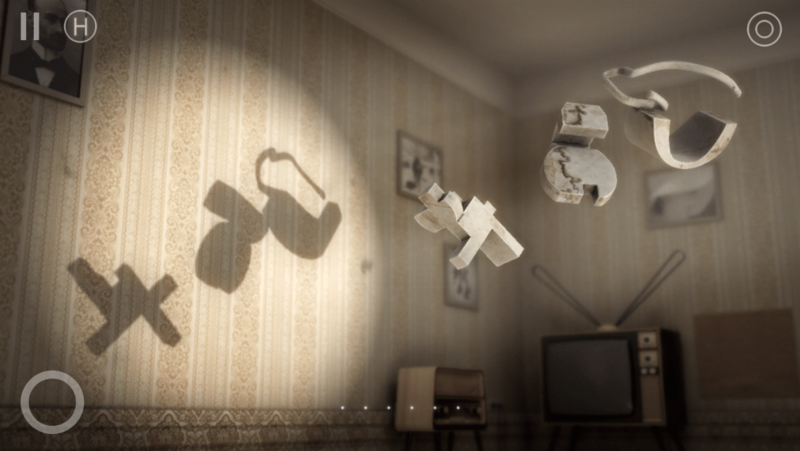 Your task is to rotate the object until its shadow resembles something less abstract. Early on, the solutions are fairly easy, and shouldn’t offer too much trouble. Then you’re introduced to puzzles with two pieces and things get really interesting. Controlling the two pieces is pretty intuitive, so those levels are often challenging but not overly frustrating. This is the game’s sweet spot. 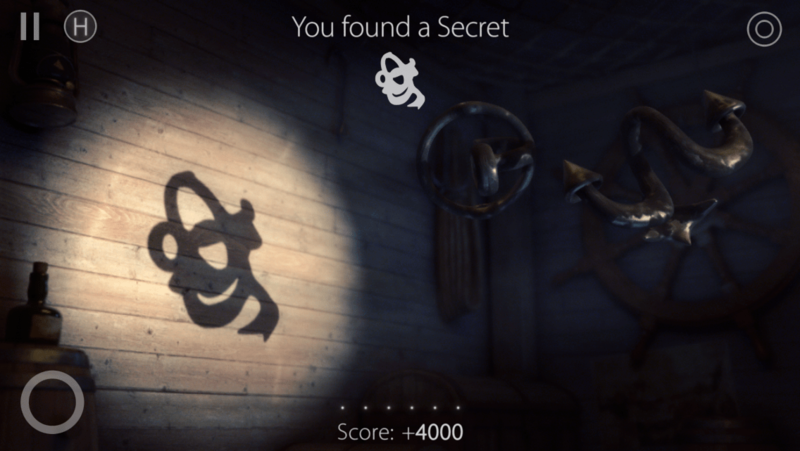 Then the game introduces three-piece puzzles. This is where things start to fall apart and the game started to lose some of its magic for me. 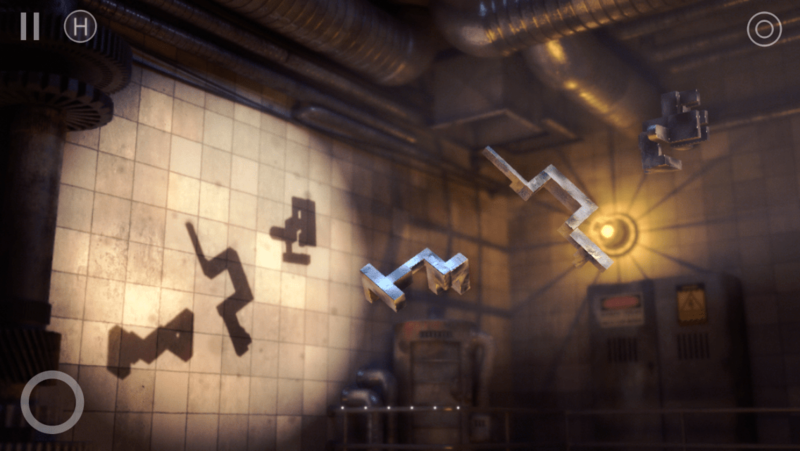 The once-simple and intuitive controls become a balancing act in these levels. Sometimes you need to have three fingers on the small iPhone screen, and if one finger moves slightly off the button in the lower left hand corner, the two pieces that were perfectly matched up will now break apart. These levels are certainly doable, as I and many others completed the game in its entirety. But it introduces an unnecessary level of frustration to an otherwise relaxing game. The game does have a progress meter at the bottom of the screen that tells you when you’re getting close to a solution. Unfortunately, it’s not always so helpful, especially with the three-piece puzzles. You can have all three pieces in the right spot, but if one is facing the wrong direction (even though it looks the same either way), the game won’t even give you one light on the meter. The second you flip that piece, it would go from zero lights to all six lights. Other times, you can get to 5.5 lights out of 6 and the game will be so stingy about that last half light. Based on the videos released and the hints system, I did have some concerns before the game came out. I expressed them in this blog post here. The gist of it is that I saw the great potential of this game if it put the players first by allowing them to play the levels in any order they want. But I had this gut feeling that wouldn’t be the case. Sadly, I was right. While the game advertises non-linear gameplay, this only means that sometimes you’ll have more than one level available to play at the same time. But you still need to unlock the levels in a specific order. You cannot skip any if you’re having trouble with it. 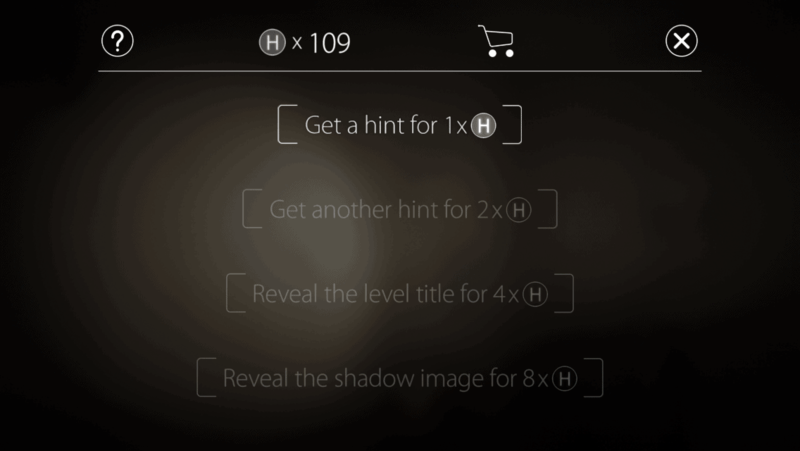 Your only options when you’re stuck are to use in-game hints (you earn some just by playing but can also purchase them with IAPs), find help elsewhere (like my walkthrough) or to simply quit playing. There is no logical reason for the game to force players to play in a linear fashion once all the mechanics are introduced. While each section (or world) has a theme, solving one level in that section doesn’t necessarily help you solve another. The themes are sometimes too broad without any other hints to go on, and they don’t help so much with a lot of the solutions as just having the shapes “speak” to you. Some of the answers are so abstract that I ended up using some hints rather than quitting outright. And sometimes I had trouble with a shape even while knowing what the game wanted. For instance, the game’s version of a key isn’t like any key I would have pictured in a million years. I also guessed a couple of answers from the first hints given, but still couldn’t make sense of the shape. 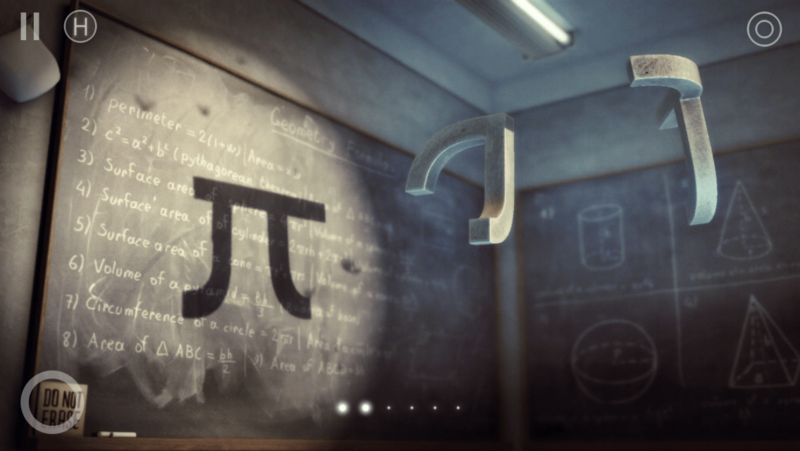 One time, I was so sure that the game wanted me to make a Pi symbol because I was close to a very convincing one, but it turned out to just be a regular letter of the alphabet. 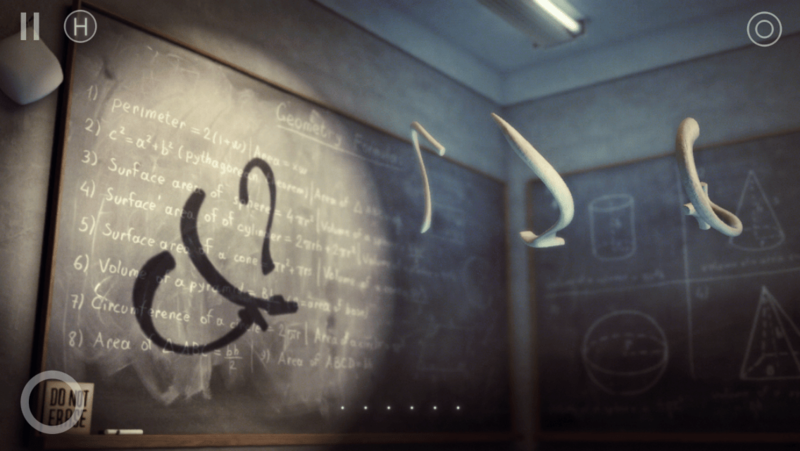 Because of all this, Shadowmatic often veers from relaxing puzzler to a frustrating exercise in patience. The game is still a gorgeous piece of artwork and an incredibly unique idea that I’m glad saw the light of day. But too many things have been overlooked that keep it from being that perfect classic that you recommend to everyone you meet, even your grandma. If you find yourself stuck, try my complete walkthrough guide with all solutions, which now includes video for all levels. Brilliant review. Why is it that you are the only reviewer on the web who will call out the flaws in a game? This is a beautiful app as every reviewer noted, but as you found it can also be an exercise in frustration. Most bothersome: Often I would find the solution in five minutes (ah, it’s a stuffed bear! ), but then I’d have to spend another five minutes micro-tweaking the shadow to the correct orientation to get credit and move on. Argh! Thanks! I honestly don’t think most reviewers played long enough to get to the three-piece puzzles, so they based their opinions on just the first part of the game. I finished it before writing my review, so I experienced alllllll the frustrations.